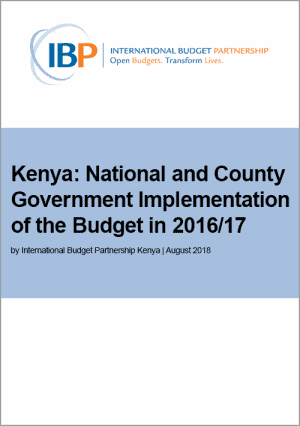 Kenya’s national and county government are required to produce budget implementation reports that provide information on revenue and expenditure performance. The information in these reports can be used to inform decision making for future budgets. These reports should be backed by adequate reasons on performance to promote public deliberation around the budget. This analysis shows that certain key sets of information is missing from publicly available budget implementation reports from 2016/17. For example, the reports do not provide any non-financial information required by the Public Finance Management Act, nor do they provide reasons on performance that could help improve budgets in future periods. This raises further questions on the role of legislature at both levels of government as they monitor and debate budget performance.